Magazine advertisements called it the “Greatest Achievement in Automotive History.” Packard Motor Company engineers had come up with what they called the Torsion-Level ride, all new for 1955. An electroniclly operated automative leveling feature, the Torsion-Level ride kept a car level at both front and rear. All Packards had it for 1955. But when you combined it with the live rear axle and four-wheel power assisted hydraulic drum brakes on the 1955 Packard Caribbean Convertible, man, now that was a car for the ages. 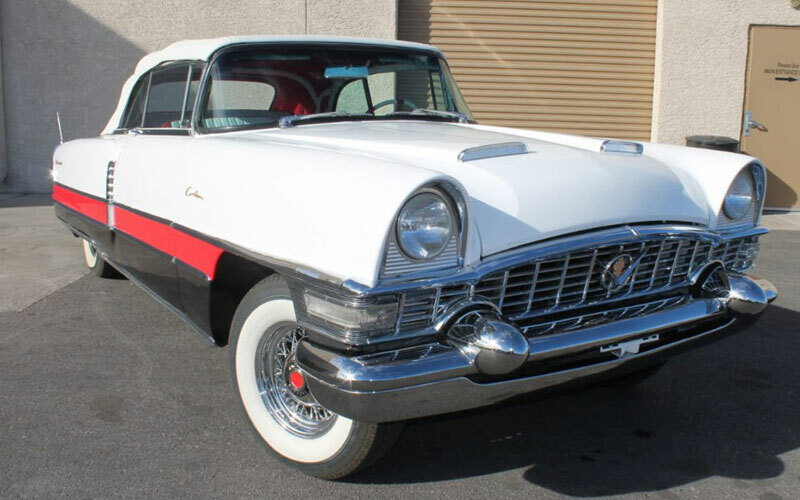 Classic & Collectible Cars of Las Vegas has one of these esteemed 1955 Packard Caribbean Convertible classics listed for sale in the Packard Section of the Cars-On-Line.com website today. It is interesting to view dozens of photos provided by the seller. (Find the ad at this link.) All new for 1955, the 352 ci V8 engine with dual quad carburetors was their high performance upgrade. Previous Packards would have had the Packard Straight 8 engine. A big luxury car would, of course, have power brakes, but this one also came with power steering, power windows, power seat, power top, dual antennas and wire wheels. 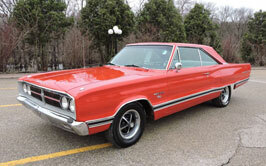 Classic & Collectible Cars of Las Vegas tells us it runs beautifully. Packard called it their “Halo” car, the flagship model that represented everything Packard stood for during the classic 1950s era. 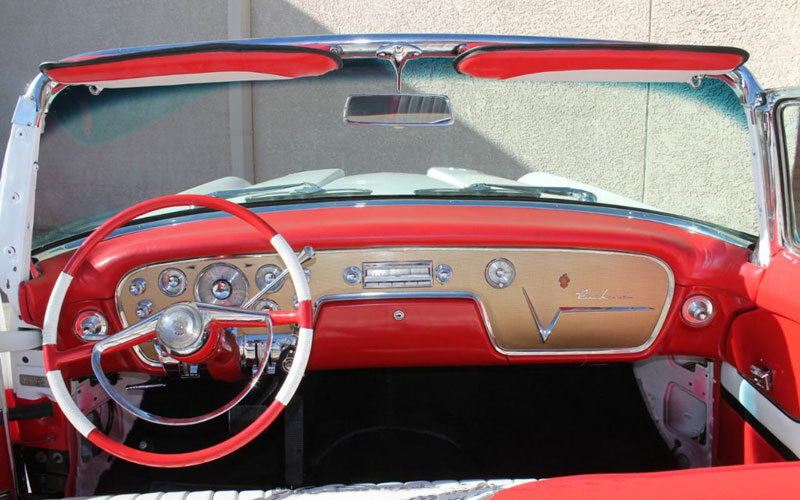 Aimed at the personal luxury car market, the 1955 Packard Carribean Convertible was a benchmark design for Packard. With its dual hood scoops, dual synchronized power antennas, cut away wheel wells and all that gorgeous chrome … man, that’s when a car was a car. And the Packard Caribbean was the one that even Cadillac envied. The one shown here at Classic & Collectible Cars of Las Vegas came from the factory finished in a desirable Packard White Jade over Fire Opal (red) and Gray Pearl tri-color exterior paint. It was the first year for the tri-tone paint schemes. They say the paint is “older” having been applied years ago. But they rate the bumpers and brightwork as being “excellent.” The Fire Opal interior and white top they call “immaculate.” These superlatives are balanced by their confirmation that some finishing work is necessary to take this car to a higher level. In keeping with the progressive forward look popular by the mid’1950’s, the 1955 Packard Caribbean Convertible introduced a new look for Packard. Packard automotive designer Richard Teague worked his magic to modernize the styling on the old Packard Senior body. A single hood scoop was split into two scoops for ’55. 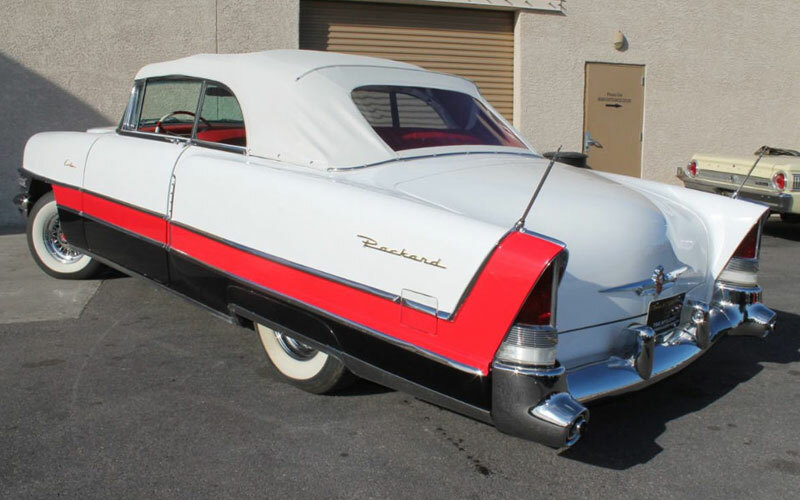 A new skin gave the bodies a distinctly different appearance, and the distinctive rear fender treatment applied above the taillights made it different than any Packard before it. And, most important, the Caribbean got the new high output 352 ci V8 engine with overhead valves. In prior years Packard’s straight 8 was standard. It was fed by dual 4-barrel carburetors housed in the iconic Batwing air cleaner. The all-new electrically-operated Torsion Level suspension was standard. All Packard models featured this new innovative front and rear torsion bar suspension system with automatic leveling. It also had a live rear axle, and four-wheel power-assisted hydraulic drum brakes. Note the photos of the deluxe “space age” dashboard, way ahead of its time. Only 500 Caribbeans were produced by Packard in 1955, the lowest number during its short production life cycle from 1953 until 1956. That makes the ’55 the most desirable for collectors. It was the flagship of the Packard lineup with a cost of $6,000 new. When the cars were bodied at the Packard plant in 1955, they were then taken to Mitchell-Bentley Corporation for finishing. From 1953 through 1955, the Caribbean model was available only as a convertible. In 1956 Packard added a hardtop version of the Caribbean. The 1955 Packard was one of the most technically advanced American automobiles of its day. The 1955 and 1956 Packard were the last signature lead cars produced by Packard, as the company ran into financial trouble and merged with Studebaker in its final days. Those last great Packards are highly sought after by collectors today. It is considered to be one of the Top 10 Classic Cars of the ’50s era.